Most drivers don't bother reading the details of the temporary "No Stopping" and "No Parking" tow away signs that are posted, and miss the opportunity to park there. 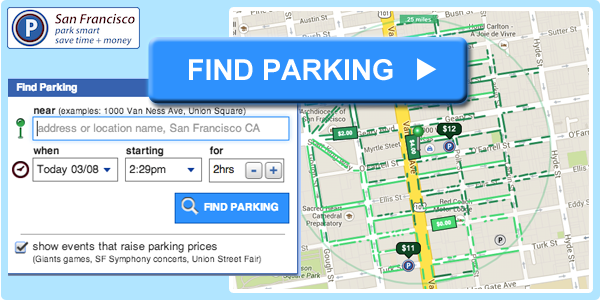 Read this article and you'll learn how to take advantage of these spots. 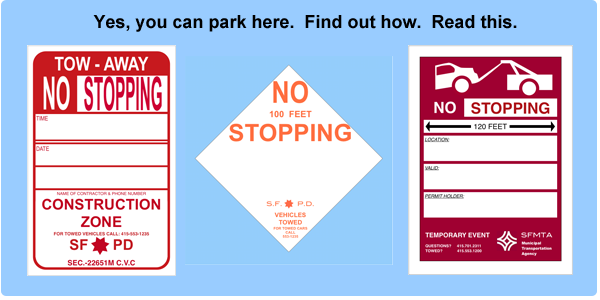 There are two major reasons why it may be worth your time to read the details of the temporary "No Stopping" and "No Parking" signs. First, these signs may be on display even though the "No Stopping" and "No Parking" rules have not started. San Francisco requires that these signs be on display no less than 24 hours before the start date for metered parking areas. For no metered parking areas, the signs must be on display no less than 72 hours before the start date. Second, drivers are allowed to park outside the hours that are printed on the signs. Most temporary "No Stopping" and "No Parking" signs do NOT apply 24/7; in most cases, the rule applies to windows of time during the day. The hours can end mid-day. Taking the time to read the temporary "No Stopping" and "No Parking" signs may help you grab a parking spot that other drivers typically pass.